Increase your Vitamin C with these healthy Juice recipes. For those who don’t like whole fruits and for those who want a change from eating whole fresh fruits, juices are a great way of consuming your share of vitamin C for the day. Just make your choice of favourite fruits, combine them in a blender / hopper to juice and have it immediately so you get the entire share if vitamin C. Enjoy our collection of Vitamin C juices. Make use of sweet fruits like papaya, muskmelon, grapes, pear, strawberry so the addition of sugar can be avoided or reduced. Muskmelon and Mint juice , Broccoli and Pear Juice, Black Grape Strawberry and Pineapple Juice, Sweet Lime Pomegranate and Apple Juice are a few sugar-free additions in this section. Check out the nutritional value table, shared at the end of each recipe to know the amount of vitamin C you have gained from these juices. Amla is a power house of Vitamic and is only 20 calories. They are great to get a glow on your skin as vitamin C acts as an antioxidant and also is important in the formation of collagen and reducing wrinkles. 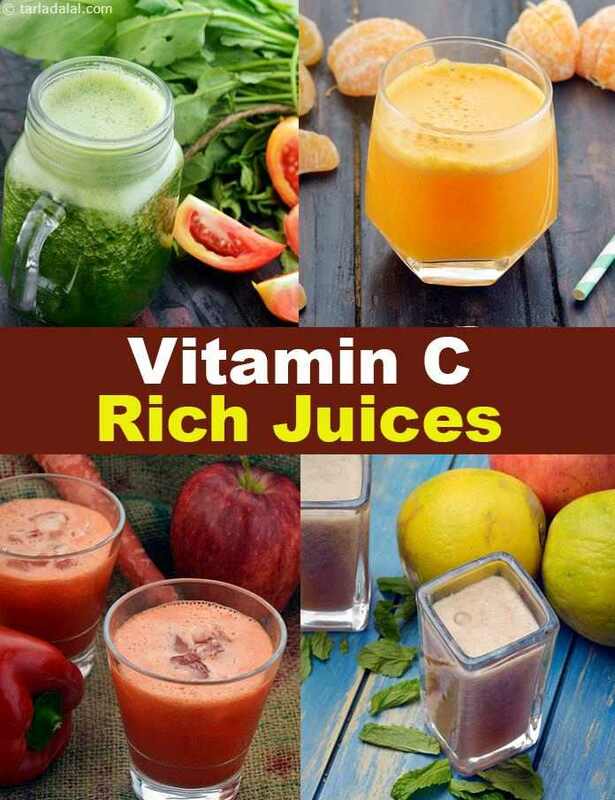 If you like this article on High Vitamin C Juices, then you will enjoy the below articles on Vitamin C rich recipes.